Vitex essential oil, also known as Agnus Castus and Chasteberry, has been used for thousands of years to aid the female reproductive system in a variety of ways. Broadly used in Europe, vitex remains an important remedy for helping regulate and stabilize female hormones, thus aiding in reproduction, reducing menstruation difficulties, easing menopause symptoms and is reported to help with symptoms of mild endometriosis. Also, a benefit of regulating female hormones, vitex can also improve acne. Vitex essential oil is interesting because, although it has a noticeable effect on female hormone levels, it actually contains no hormones itself. This makes it a natural, gentle option for those wishing to aid in the regulation of their hormone levels. There are not any know adverse side effects of vitex when taken in moderation. Natural Fertility Info explains that vitex has been proven to effectively balance female fertility hormones. Using vitex essential oil has a regulating effect upon the pituitary gland, the same gland that influences the amount of hormones produced by the ovaries. Increases luteinizing hormone levels – luteinizing hormones encourage ovulation. Raise progesterone levels – the corpeus luteum is responsible for releasing progesterone, and vitex aids in corpeus luteum formation. Helps with mild endometriosis – German gynecologists regularly use vitex on patients with mild endometriosis. Can help discourage miscarriage – miscarriages caused by low progesterone levels can sometimes be avoided through the progesterone-producing effects of vitex. Pregnant women, however, should always consult a medical practitioner before using any herb during pregnancy. Reduces menstruation difficulties – because of its regulating effects, vitex has been shown to both bring about menstruation when it is absent, and regulate it when it is erratic. Improves acne – combined with an improved diet, vitex can reduce acne. Help with milk production – when used right after having a child, vitex can assist in milk production. How to use vitex essential oils? The best way to use vitex essential oils is to simply inhale the oils through an inhaler, essential oil diffuser, or nebulizer. 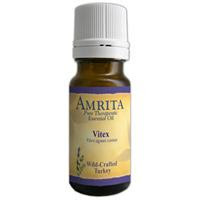 Vitex essential oil can also be mixed with creams or lotions with a suggested ratio of 2% vitex. When doing this we recommend only the use of organic lotions or carrier oils like organic jojoba oil. Vitex essential oil should not be ingested unless otherwise advised by a physician. Produced by steaming the wildcrafted leaves and berries of the Vitex agnus-castus plant, our wildcrafted essential oils are some of the highest quality pure essential oils on the market. Made from plants that struggled to survive out in the wild, wildcraft creates the best essential oils you can buy. This means your vitex essential oil will be as pure and of reliable potency, giving you the effects you desire from your wildcrafted essential oils. Though the effects of vitex, and wildcrafted essential oils in general, have been proven over the course of centuries, it is important to recognize that none of this information should be taken as medical advice. Pure essential oils can be quite beneficial, but the advice of a medical professional is always advisable if you have questions concerning your individual situation. At The OM Shoppe we take pride in only providing the best essential oils available, and we encourage you to try our products to see what we mean. Pure essential oils and aromatherapy essential oils are amazing products, and must be experienced to be appreciated. The article is very nice. I like it. I got many valuable information's. I am very much fond of articles related to essential oils.Thank you for your nice shearing. I really appreciate your work...Very informative post!!! Thanks for the valuable information...That was all great to know!!! Keep up the great work...Wonderful work!! !